Fidget Spinner: A Stress-Reliever, Or a Mere Toy? A new trend has made its way into the classroom: the fidget spinner. The long hours in a school day tend to make it difficult for children to focus. 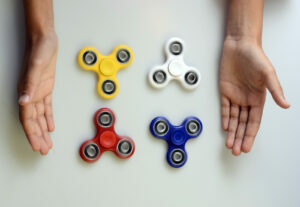 Many fidget devices have been invented over the years to help these children to release their stress and provide better focus to their teachers. While those devices have caused little issues in the past, fidget spinners have become controversial in the classroom. Fidget spinners are often mistaken as a toy by children due to their many shapes, sizes, and colors offered. They have become the top selling toy on Amazon. Best Product shows fidget spinners as one of the best toys on the market. Retail stores are now offering these devices in their toy departments. Forbes has called fidget spinners the “must-have office toy of 2017”. Children and adults alike are taking away the purpose of the fidget spinner and turning it into a classroom toy. What Are Teachers Saying About the Fidget Spinner? Have Fun Teaching recently took to Facebook to ask teachers their opinion on fidget spinners. When asked whether these devices promoted positive classroom management, many said no, but offered some leeway. “Not at all, unless written into Education plans or suggested for interventions.” – Kathy H.
Teachers believe this new fad has become a major distraction in their classroom and is just another toy. Other teachers believe these have benefited their ADHD and autistic children. 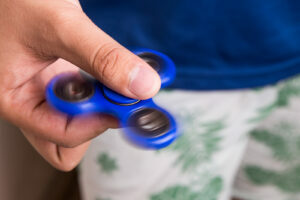 “[Fidget spinners are] useful for autistic children who need these to alleviate anxiety and in some cases children with ADHD who would find anything to fiddle with than focus.” – Lesley S.
While some teachers did not provide an opinion either way, they offered alternative advice on classroom management. “There wouldn’t be such a need or desire for fidgets if children had more movement, standing desk options and sensory fulfillment.” – Nechole J. As teachers, we need to find ways to help children focus. Fidget spinners may be the answer for some children. Allowing children to stand for short periods of time could help others. Find something that interests the child that is struggling to focus. Have Fun Teaching offers many Behavior Management resources for your classroom! We also offer Character Education Songs and Activities that will promote positive behavior in the classroom. Be sure to share your classroom management tips on our Facebook page!